They may look funny and make you walk like a penguin, but scuba fins are highly engineered pieces of precision gear, and choosing the right type is essential to enjoyable, effective diving. While fins for snorkeling and swimming may be made of rubber, plastic or combination materials, those used for scuba diving are usually high-quality polyurethane or polypropylene. Different fins are designed for different types of diving, so a scuba fin that is appropriate for gentle drift diving in the Caribbean may not work well for cave diving. Years of research have been devoted to developing different fin materials and designs to maximize fin propulsion while minimizing kicking effort. In the following pages, learn about the different styles and features of scuba diving fins before deciding on a scuba fin purchase. Styles and Features of Scuba Fins Fins may be flexible or very stiff. This image of the Aqualung Blade II Flex Scuba Fin illustrates one way to test a fin's flexibility. Image reproduced with the permission of Aqualung. Flexibility is an important consideration when selecting scuba fins. Some fins are extremely stiff while others are quite flexible. Stiff fins are better than very flexible fins for frog kicking and work well for advanced propulsion techniques, such as helicopter turns and backing up. For flutter kicking, stiff fins will usually propel a diver farther per a kick cycle than a similarly designed, more flexible fin. However, flutter kicking through an entire dive with very stiff fins can be exhausting. Styles and Features of Scuba Diving Fins Examples of scuba fins with closed heels. From left to right: Cressi Gara 3000 LD, Cressi Pro Star, US Divers Proflex, and Aqualung Proflex II. Images reproduced with the permission of Cressi and Aqualung. Closed heel scuba fins have rubber foot pockets that completely cover the diver's heel. Closed heel fins are designed to be used without dive booties, and are comfortable on warm water dives. However, those who dive in cold water need fins that fit over dive booties to keep their feet warm. Divers planning on shore diving, or on any dives requiring them to walk in scuba gear may prefer fins that accommodate dive booties to protect their feet while entering and exiting the water. Styles and Features of Scuba Fins Scuba fins with open heels are designed for use with dive booties. From left to right: Cressi Frog, Aqualung Slingshot, Aqualung Blade II, and Oceanic Vortex V8. Images reproduced with the permission of Cressi, Aqualung, and Oceanic. Open heel fins are designed for use with dive booties, so the foot pockets are larger than those of closed heel scuba fins. The foot pocket is made of a harder material, so wearing these scuba fins without dive booties is uncomfortable. 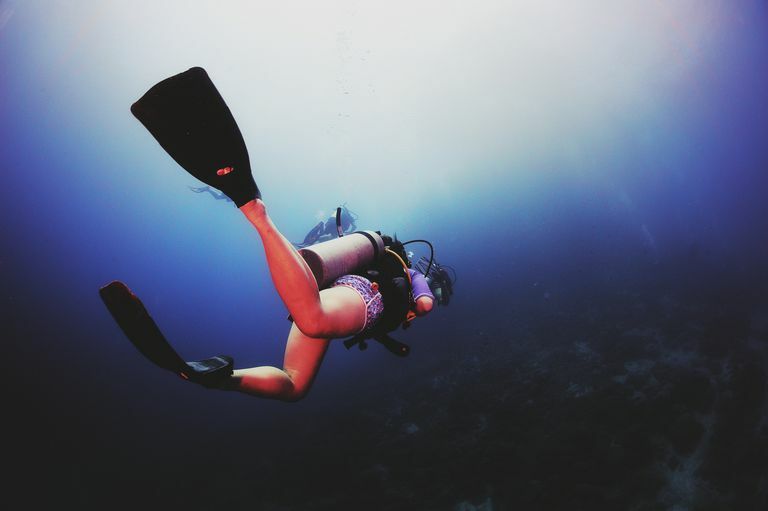 The open-heeled fins and dive booties combination is preferred by many divers, as the booties keep diver's feet warm and protect the feet while entering and exiting the water. Styles and Features of Scuba Fins Different styles of Strap Attachments. Images reproduces with the permission of ScubaPro (spring straps) and Cressi (standard straps). A feature to consider in open-heeled fins is the type of strap. A standard strap is made of a piece of flexible rubber that can be tightened and loosened. Some manufacturers have developed standard straps that can be unclipped to make them easier to put on and take off. The spring strap is a tightly coiled, durable metal spring that stretches over a diver's heel. Spring straps are quite comfortable, and very easy to put on and take off. Spring straps can be purchased to fit most styles of fins. Styles and Features of Scuba Fins Blade fins are made of a continuous pieces of plastic or rubber. Examples of blade fins from left to right: US Divers Proflex, Aqualung Blade II Flex, Cressi Reaction Pro, and ScubaPro Jet Sport. Images reproduced with the permission of Aqualung, Cressi, and ScubaPro. Blade fins are made of a continuous piece of plastic or rubber. Design features such as soft rubber panels or holes in the fin help to channel water for a more efficient kick. These fins work well for both frog kicking and flutter kicking. Blade fins, designed with varying degrees of flexibility, are generally used by divers who do not need to fight strong currents or swim quickly, and for those whose legs tire easily. Stiffer blades are appropriate for those who dive in strong currents and need a fin that can withstand the additional stress. Styles and Features of Scuba Fins Examples of split fins, left to right: Aqualung V-Tek Split Fin, ScubaPro Twin Jet, and ScubaPro Twin Jet Max. Images reproduced with the permission of Aqualung and ScubaPro. Split fins have a large cut splitting the center of the fin into two distinct pieces. These fins are good for flutter kicking but do not work very well for the frog kick. The split in the center of the fin reduces the effort it takes to kick, while still providing a reasonable amount of forwarding propulsion. Divers with joint problems or whose muscles tire or cramp easily love split scuba fins because of the reduced strain on the legs and feet. Split fins work well in conditions with little or light current but may require excessive kicking to fight a strong current. Styles and Features of Scuba Fins Short snorkeling fins are great for snorkeling, but inappropriate for diving. Images reproduced with the permission of Cressi. Some fins are designed specifically for snorkeling. These fins are very short, which makes them easy to kick and putter about on the surface. Balancing to stand in shallow water is easy with these fins. While snorkeling fins are great for snorkeling, they will not provide sufficient propulsion for scuba diving, because a scuba diver is wearing gear that increases his water resistance. A scuba diver using snorkeling fins will have to kick fast or hard to keep up with other divers. Styles and Features of Scuba Fins Turtle fins are a classic fin style. Examples of turtle fins from left to right: Hollis F1, Aqualung Rocket, and ScubaPro Jet Fin. Short, stiff scuba fins are a classic design. Turtle fins are usually quite thick and are heavier than standard scuba fins. Used with the frog kick, these fins work well for technical diving and for advanced diving propulsion techniques, such as helicopter turns and backing up. A simple flutter kick with turtle-style fins will move a diver quickly but can be exhausting. This fin's simple design is so effective that most scuba equipment manufacturers offer some version of the turtle fin, and many designs have remained unchanged for decades. Technical divers, such as wreck and cave divers, love these fins because they provide great propulsion but are short enough to avoid kicking the ceiling in smaller areas. Styles and Features of Scuba Fins Examples of Cressi freediving fins, Gara Pro (left) and Gara 3000 LD (right). Images reproduced with the permission of Cressi. Freediving fins are perhaps the least common style of fin seen on recreational scuba divers. Freediving fins are characterized by very long, thin and relatively stiff blades. Originally designed for breath-hold diving, these fins take a bit practice but are effective for both flutter kicking and frog kicking. Because of their long blades, freediving fins can move divers very quickly and provide strong propulsion. Styles and Features of Scuba Fins Colorful scuba fins help to identify divers underwater. Examples of colorful fins from left to right: Aqualung Slingshot, Cressi Reaction Pro, Aqualung Blade II, and Cressi Pro Star. Images reproduced with the permission of Aqualung and Cressi. Scuba fin colors are not merely aesthetic. During a dive, brightly colored fins are easy to see and can be used to identify an individual. Those who dive in low visibility may prefer fins that are a bright color, such as neon yellow, which is easier to spot underwater than black or subtle colors. When purchasing fins, consider a unique or bright color that is easy for dive companions to find underwater. Styles and Features of Scuba Fins The Aqualung Slingshot (left) and the ScubaPro Nova (right) are examples of innovative fin designs. Images reproduced with the permssion of ScubaPro and Aqualung. Manufacturers such as ScubaPro and Aqualung have developed some innovative scuba fin designs. Some fins incorporate elastic rubber elements that add a bit snap to a kick and may increase kicking efficiency. The ScubaPro Nova has an interesting wing-like shape, designed to reduce effort and increase propulsion in both frog and flutter kicking. The Aqualung Slingshot can be adjusted during a dive via a “gear shifting” mechanism to provide more or less resistance.